← Goodwood Revival 2012 Photos! As winter waves its white hanky at the world, Spring and early Summer means one thing for most of us; the lul before the WWII events and… Carbooting! Unfortunately due to wedding costs, I cannot afford our much loved flea fairs at present, so we are resorting to the odd visit to the local carboot instead. With a budget of £15 you can still find some amazing bargains if you hunt carefully enough! Another great tip is to wait until right at the end of the carboot for when people are packing up. Some stall holders cannot be bothered to take things home so either leave a box of ‘junk’ by a bin that can hold a few treasures or sell things off for coppers. Our recent treks to the carboot have been most satisfying and I managed some great finds! My first was a studio photo of the Beverley Sisters, which was not only signed on the back, but also again on a page from an autograph book. This fantastic piece of vintage music memorabilia from the very early 50’s only cost me £4! I am planning to mount it in a frame with a Beverley Sisters LP when I get around to it. 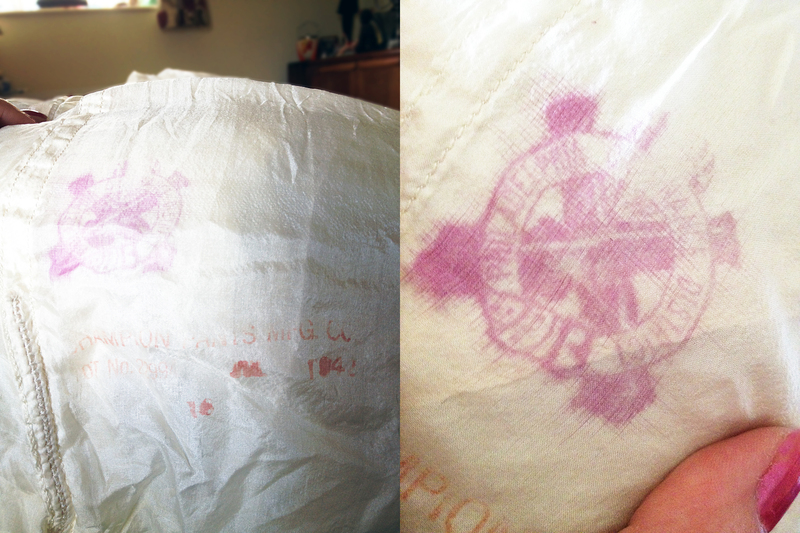 On our second visit I managed to pick up a WWII American parachute, which Mr. Mew had seen the previous week. The guy was offering it for £35 (an amazing price indeed!!! ), but sold it to me for £28 in a tatty canvas bag. On taking it out, I saw that it was dated 1942 and stamped with the makers name (a men’s trouser company) and the logo for Philadelphia Ordnance District where munitions have been made since the 20’s. 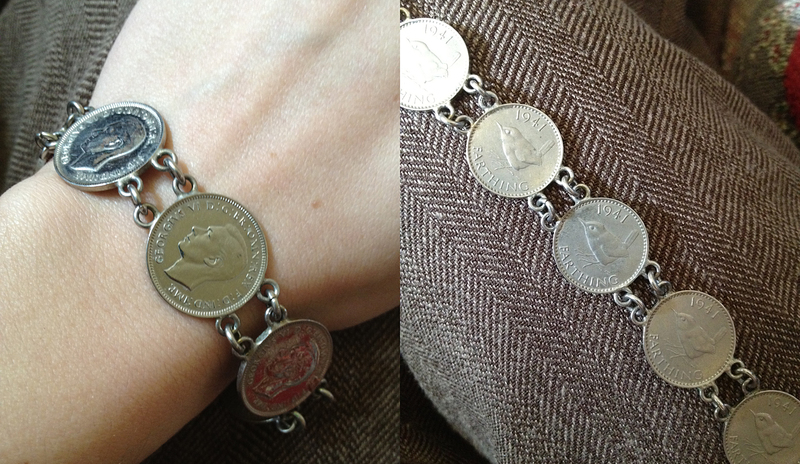 My final great find was the King George Farthing Bracelet, with coins dating from 1941 and 1942. A great piece of sweetheart jewellery from the war, it has been masterfully made without drilling holes into the coins and dipped into silver (as the coins are originally copper). This fabulous bracelet cost me just £2 and was met with envious eyes when showing friends! Carboots are certainly getting more difficult to find collectible wartime memorabilia at good prices, especially as half seems to be pricey antiques dealers and the other half people flogging their Danielle Steele collection, Challenge Anneka board games and marble print dining curtains. There are still a few gems out there and as long as you aren’t too fussy about condition, you may be able to grab a few 1940’s books and china wear to add vintage touches to your home too. A good tip for the ladies; don’t be afraid to dress up for these field events. Although you may stumble and totter over a few pot holes… and small dogs on too longer leash, there is a lot to be said about the power of vintage fashion! I never go to any flea market or jumble sale without some form of iconic headwear and a red lipstick smile. This proves a useful talking point with the sellers and has gained me quite a few bargains and some wonderful connections in my time! Posted in Uncategorized and tagged 1940's bracelet, carboot, carboots, coin bracelet, flea market, military magazine, wwii blog, wwii magazine, wwii parachute. Bookmark the permalink.